Keurig B30 Mini Brewer Single Serve Coffee Maker Review. 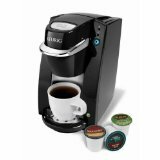 This Keurig B30 Mini Brewer Single Serve Coffee Maker is not made for brewing multiple cups of coffee. It's use is more for the occasional cup of coffee, such as at work or in your home office. You need to add water and turn the unit on for each cup you make, as it shuts itself off after brewing a cup. So if you are looking for a single serve home brewer that uses coffee pods and makes multiple cups, then you should choose a different model. Perhaps the Keurig B40 Elite, which is larger and a little noisier, but can handle multiple cups of coffee without restarting each time. But if you want a brewer for that occasional cup of coffee, this is it. Some of the features most Keurig models have that the B30 doesn't is a built-in grinder, timer, pause n' serve, warming plate, and can use more than one size of k-cup. Even though it only uses one size of k-cup, you still have over 70 varieties of gourmet coffee, tea, and hot chocolate. It is very simple to use. Some other locations you might want to have one of these Keurig B30 Mini Brewer Single Serve Coffee Makers would be your vacation home, cabins, boats, or RVs. The size is smaller than most other single serve brewers. So if you have minimal space, this brewer would be perfect.